53 people have viewed this property this week. Welcome to Kai Vista! 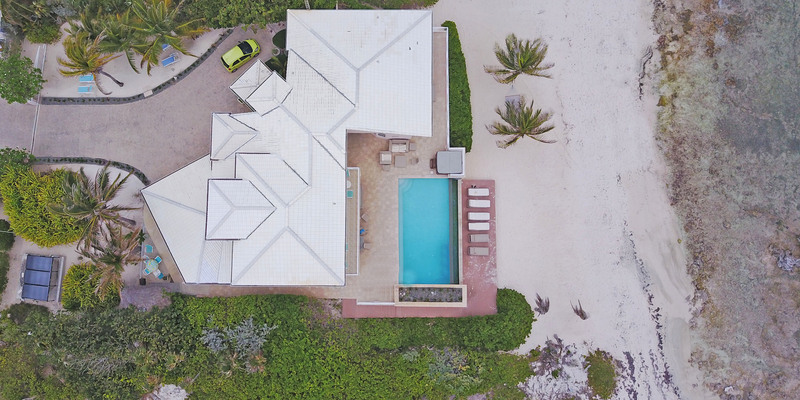 Located in Rum Point along the north coast, this luxe villa sits elevated on a ridge, offers excellent snorkeling off a private sandy beach, features an oceanfront infinity pool and hot tub, and a beachfront sundeck with plush loungers. 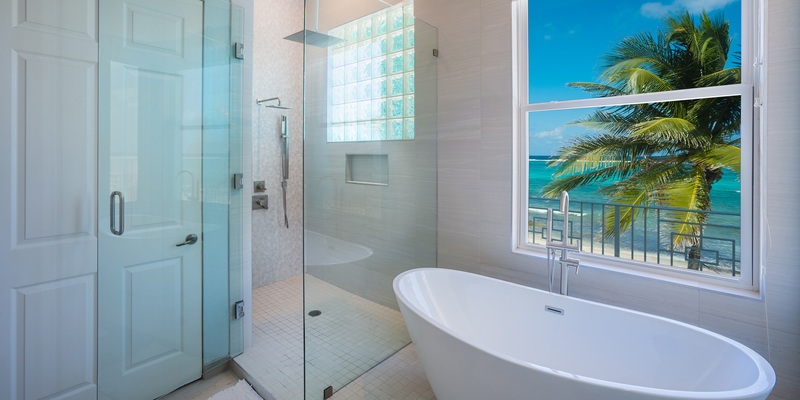 The homeowners have embraced an eco-friendly approach to recent renovations including: upgrading the home's insulation, converting all lighting to warm LED fixtures, installing a high-efficiency air conditioning system, and installing a solar powered hot water heater and pool pump. Designed to make you feel like a part of the ocean, Kai Vista does not disappoint. Scenic oceanfront views are captured through 30 foot tall sliding glass doors that open and flood the villa with island breezes and natural light. An enormous open-concept living area, with spectacular ocean views throughout, has two separate seating areas with sectional sofas plus a 55-inch flat screen TV with Apple TV and stereo for the whole family to enjoy. A fully renovated gourmet kitchen includes all new appliances, granite countertops, and a wet bar with separate ice maker. A new propane grill on the side of the house is available for cookouts. 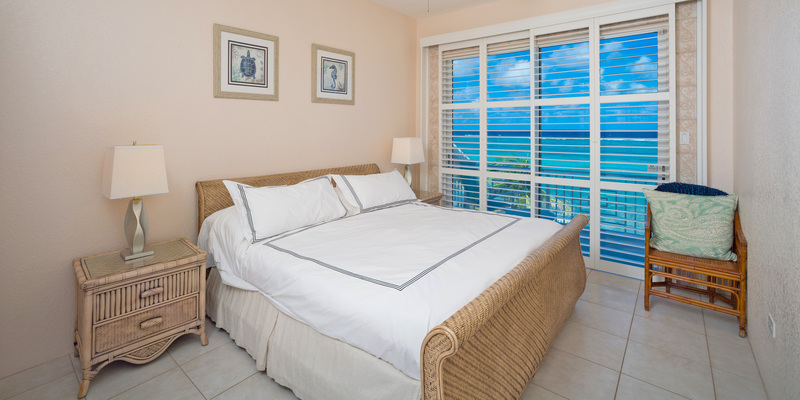 With two bedrooms on both the main and upper floors Kai Vista can sleep up to 9 guests. 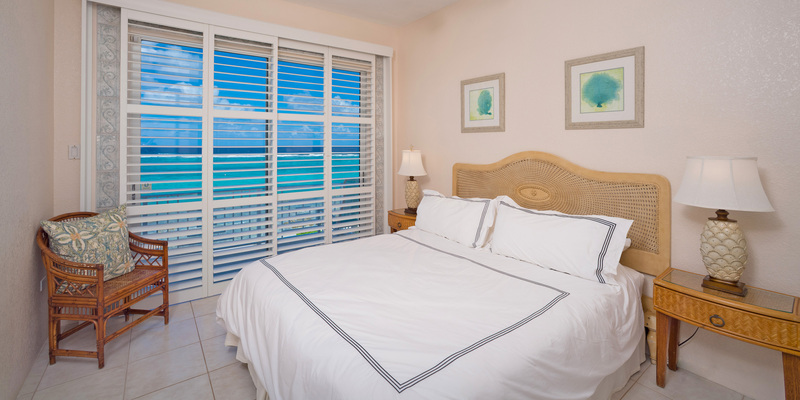 The downstairs master bedroom suite has oceanfront views, a king-sized bed, private en-suite bath with oversized bath tub, and sliding doors opening to the pool deck. The other downstairs bedroom sits at the front of the house with a queen-sized bed and adjacent full bathroom. 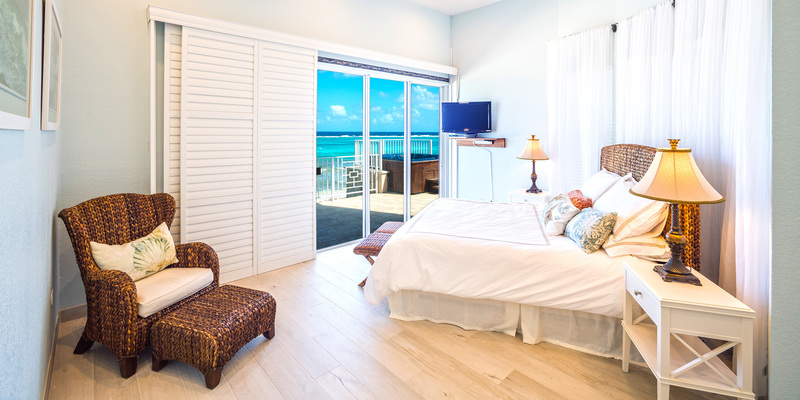 Upstairs, both bedrooms are oceanfront suites with king-sized beds, en-suite baths, and sliding glass doors onto a shared balcony. The sleeper sofa in the loft area is perfect for children. 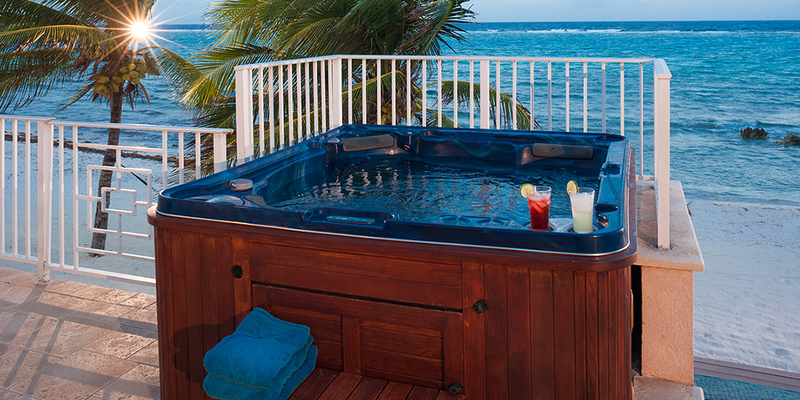 Only 250 yards from the Rum Point Club, Kai Vista boasts an exceptional location on top of its luxurious amenities. A very sandy beach offers long walks in either direction with plenty of privacy. We advise divers and snorkelers to wear pool shoes or fins when out in the water to avoid injury. *Note: Additional Silver Thatch kayaks available for discounted rental. Signed waiver and 5 day minimum required with 6th and 7th day free: US$39 per day per kayak ($195 per week/each). Paddles included. 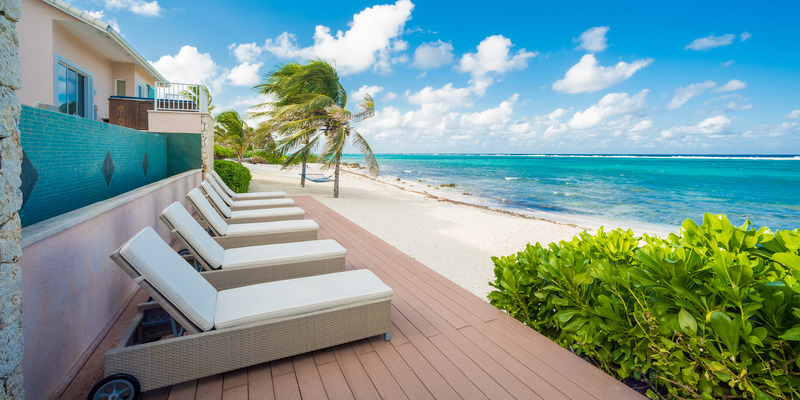 The entire island is only 22 miles wide from west to east, so you are never too far from anywhere on Grand Cayman. 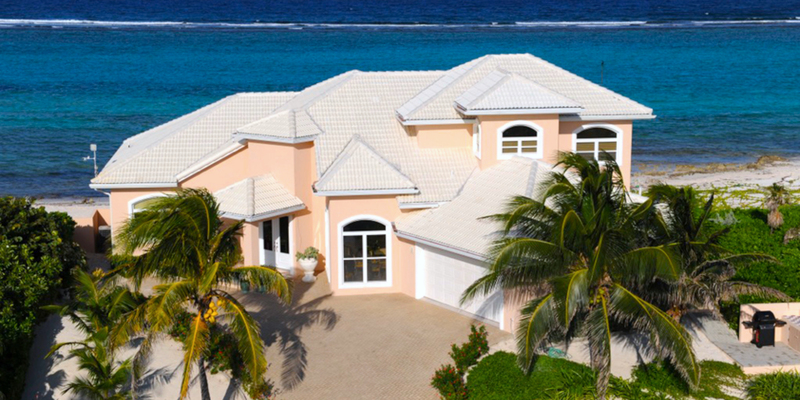 The homes on the oceanfront in Rum Point offer great reef protected snorkeling. The beaches usually have plenty of white sand, but can also have spots of rocky “ironshore” with natural rock formations. Kai Vista's beach changes with each passing storm. It can be well covered and sandy at times and then have rugged ironshore in the water at others--just a function of its location on the island. The beach here is "public" in that you can use the water entry on the adjacent lots or walk as far as you want east or west. With the abundant marine life we have in the water you will want to wear pool shoes or fins for foot protection. The prevailing trade winds from the east make flying insects less of a nuisance—many of the homes in Rum Point don’t even need a screened porch. Lastly, we have 2 large resorts in the east end (Morritt's and The Reef) that offer manicured beaches as well as restaurants, a modern grocery store, liquor store, gift shops, a Subway sandwich shop, and a cafe/pastry shop. 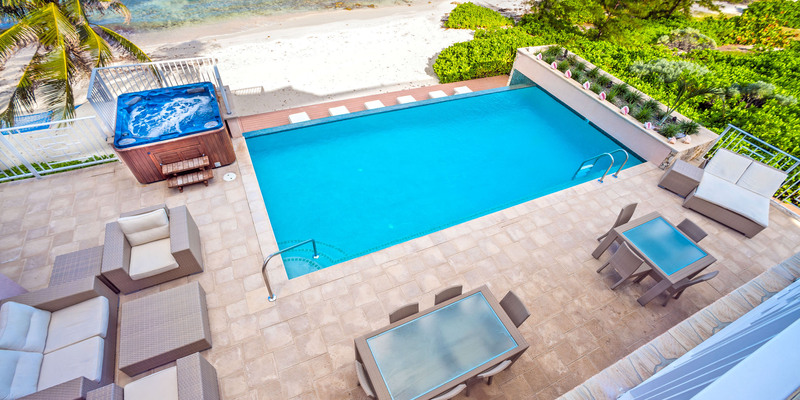 These two resorts also offer scuba, snorkel trips, jet skis, windsurfing, kiteboarding, ocean front pools and bar service. *Signed waiver and 5 day minimum required with 6th and 7th day free, paddles included! US$39 per day per kayak ($195 per week/each). We had a wonderful vacation!! Beautiful house with awesome snorkeling right out back of the house!! We loved the pool and hot tub!! Thank you for making this trip easy!!! We truly appreciate all that you have done to make it memorable!!! Kai Vista was a great find for us 4 couples. A lot bigger than the pictures suggest and every amentity was at our fingertips. The view from inside of the house is jaw dropping when you walk in the front door. The kitchen has great appliances and multiple fridge locations in the house/garage. The outside living area is great with a large patio overlooking the beach and water. Hot tub was used daily which was very relaxing. Water shoes are a must if you want to snorkel. The property manager Roy was a great wealth of knowledge of the island and met us on the first day at the villa. We called him once during the week to ask about the kayaks and he was fast to react. 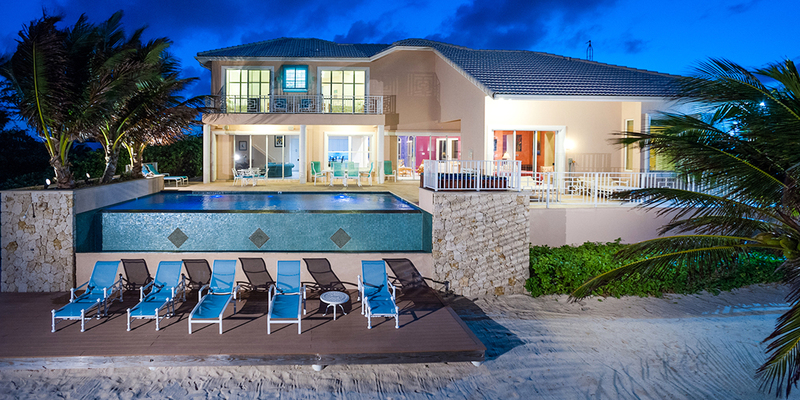 Grand Cayman Villas was a pleasure to deal with too during the whole process. The only slight drawback, if I had to find a negative, is that one of the rooms doesn’t have an ocean view (oh, the horror). We walked to Rum Point Club for lunch and drinks multiple times. Kaibo was a short drive and was our favorite spot due to the atmosphere. Overall this was a great experience with all parties involved. Thank you! So glad you had a nice stay! Please come back soon!!! Kai Vista did not disappoint! What a beautiful slice of paradise. The villa is beautifully appointed, beds quite comfortable, lots of spaces inside and out to split up and have some privacy from the rest of your party if you’d like. In January, it was wise to pay the extra amount to have the pool heater turned on! You definitely need some type of splash shoes to walk into the ocean from in front of the villa and down the beach to Rum Point, where there is a sandy beach, good swimming and a bar/restaurant. You can check out snorkel equipment at no extra charge at Silver Thatch and would recommend you do that when you stop to check in so you don’t have to make a trip back down. There are kayaks at the property, but a call to the manager’s office failed to get us the combination to unlock them and they didn’t seem to know where the paddles were. There is also a nice array of kitchen equipment such as a Keurig, coffee maker with filters, blender, etc. We ordered dish soap, dishwasher soap and laundry detergent, none of which we needed as they were all provided as well. Many spices such as salt & pepper were already there, which was a nice touch. A rental car is a must, although we had been to the island before and had already seen many of the attractions, we didn’t feel the need to go exploring once we got to the villa. It was nice to be a bit secluded, not hassle with noisy hotel guests or fight for a place at the pool or beach. We just wanted to stay at the villa and enjoy the solitude while having our own “home” to run in to, get a drink, fix lunch, and enjoy the warm weather. We had Eddie pre-stock groceries - highly recommended. Chisolm’s market is a short drive from the villa for munchies, sunscreen, local fruit, or alcohol. Kai Zen is a wonderful place and well worth the trip. Thanks to the owners for opening up their home to our family. Thank you for your review. I wish you had contacted us about the kayaks. They are not owned by the owner, but by Silver Thatch Guest Services. We could have offered you a discounted rate, added to your reservation and had the codes to you in no time! The villas do not stock many of those items due to allergies. Prior guests leave them, and we keep non-perishables. Please come back soon! The owner would love to have you back!!! This is one of the most, if not THE most beautiful villas on the coast. The pictures and description were spot on. Very clean, lots of space, fast and efficient AC, great infinity pool, comfy beds, pillows and linens, fully stocked kitchen, many different areas to lounge separately both in the sun and shade outside, state of the art tv equipment, very good WiFi and nice amenities like shampoo, conditioner, body wash and lotion in each bathroom. The ability to open the walls and let the outside in was a very nice feature as well. Definitely will need splash shoes to be able to walk across rocks and coral into the water off The sand beach. The only cons were the hot tub (motor had seized up right before we arrived and replacement part was not available while we were there) not being functional and not easily being able to access the kayaks/paddles. We tried the property manager’s office but were given conflicting information and just chose not to pursue it further. This could be made clear through more specific printed instructions in the villa. 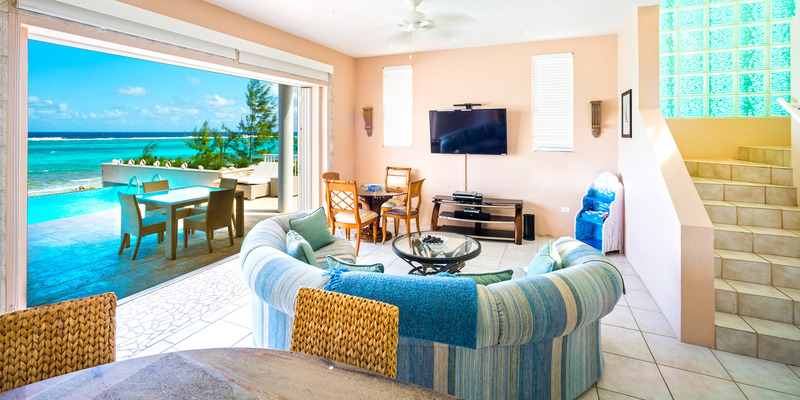 The Grand Cayman Villa managers (Scott and staff) were extremely helpful with rental agreements and questions and made the booking and follow up arrangements like car rental recommendations and advanced grocery purchases very easy. Their responses to questions were always immediate and helpful. One thing I might recommend is a comprehensive list of all items regularly stocked (and not provided) in the villa; such as a more than adequate supply of laundry, dish soap and dishwasher detergents, shampoo, conditioner, body wash and body lotion. We had our grocery buyer buy many if these items and it was an unnecessary expense as they were already supplied.) Also note that there is a convenience market 5 minutes down the road for basic munchies and supplies. Overall, it was an unqualified success at a luxurious facility. We felt lucky to have been able to rent it and made wonderful memories with our family. Thank you for your kind words. We love Kai Vista!!! Please come back soon!!! Family of five that includes three teens. The house was perfect! 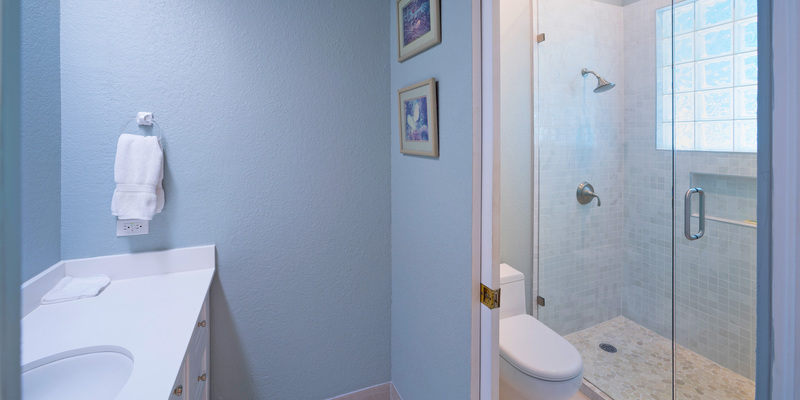 The home is spacious with plenty of bathrooms and lounging areas. Well appointed and outfitted. The North side of the island is very quiet and we felt like we were all alone. Fantastic pool and ocean entry. Close to Rum Point (walking) where you can dine or partake in Red Sail activities. There are a few other restaurants near by but not many. You need a car if you are staying on this part of the island but if you are looking for a quiet getaway than this is the spot. We absolutely loved Kai Vista and would highly recommend it. We booked Kai Vista for 5 nights in August for ourselves, our 2 adult children and their spouses. All of us absolutely loved the villa. As an owner of vacation rental property, I thought the owners really did a great job of providing everything needed. Since this property is on the north side & having what you need when you get there is really important. The management company was easy to work with. They responded to all of our inquiries prior to our arrival and tended to our needs during our stay. There are 2 kayaks available for use after signing a waiver. There is a box by the pool with pool toys, floats, etc. so don\'t worry about bringing those type items. The owners left the older but more portable beach chaise lounges in a garden area in the front yard. We used these on the beach some. But, be nice and return to their proper locations before you leave. There are no beach umbrellas for use so we rented a couple of those along w/ chairs from Empty Suitcases. There is some beach shade provided by two palm trees in the afternoon. Swim shoes are a must so bring a pair for everyone that plans on entering the water at the villa. They have both drip and Keurig type coffee makers. Prior guest have left plenty of coffee filters and various spices for cooking. There were several coolers available for use. The kitchen is stocked better than our own home. There is even an extra fridge in the garage that provides extra cold storage and an additional source of ice daily. There is a neat grilling area but bring lots of charcoal as the north shore breezes shorten the life of the charcoal. The grill itself could use some work but I know what salt air does to metal items. Buy laundry detergent at your grocery stop as we needed to wash the beach towels provided midweek. Overall, a wonderful villa and a great location to spend time with the ones you love. Thanks so much. Had 4 couples sharing this home. All of us we more than impressed. The amount of amenities in the kitchen was surprising and appreciated when fixing meals. We all said we would love to go back again someday. Paradise, would be our description. The house was perfect, plenty of room for everyone, we loved opening up the house to the breeze and sitting out by the pool relaxing, what a view, sunrise and sunset. This is definitely the side of the island to stay on if you are looking to relax. We had a great time shell hunting on the beach ever day and we spent plenty of time in the pool and hot tube. The pool is really more of an over flow pool then a continuous infinity pool but an awesome experience. We only had one minor issue and it was replaced within hours so the customer service is top notch. We would highly recommend Kai Vista, it is a trip we will never forget. Thank you for your kind words. 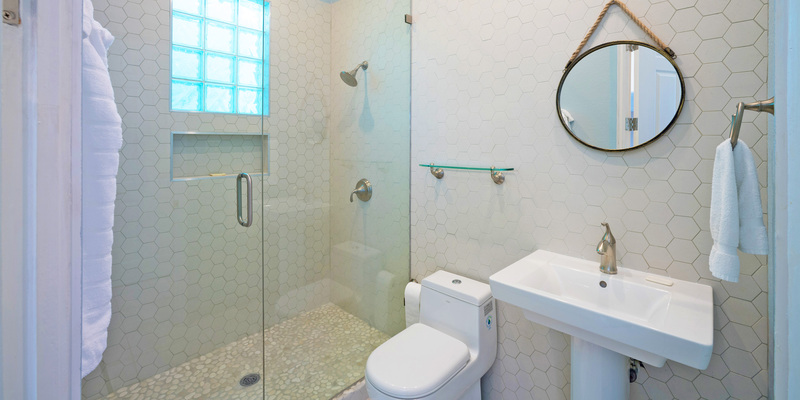 The owner takes great pride in the home and recently renovated all bathrooms! Please come back soon! Amazing, quiet property! Great house, great pool, great view! We had 9 people (4 adults, 5 kids) and the property worked perfectly. We spent most every day bouncing between the pool, jacuzzi, and beach. We looked the quiet, reserved and private nature of the property. So different than the hustle/bustle of staying at a hotel or resort. We also ate most every meal there. So it was great spending time with family/friends without the normal distractions that come with traveling vacations. We will definitely consider a return trip to the Kai Viasta! Definitely bring your aqua shoes. The surf is pretty rocky. Excellent property... the house is open and breezy and the location is terrific. The house had all the amenities you could want and the pool and hot tub were a perfect pair. 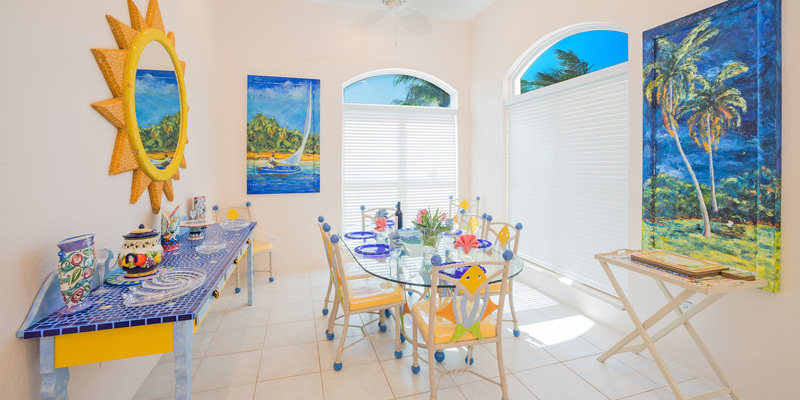 It is located close enough to Rum point to walk and biking or a long walk (2 miles) to Star Fish Point, both have beautiful sandy beaches and clear water. There are plenty of restaurant options close. Kai Vista - The Whole Package! 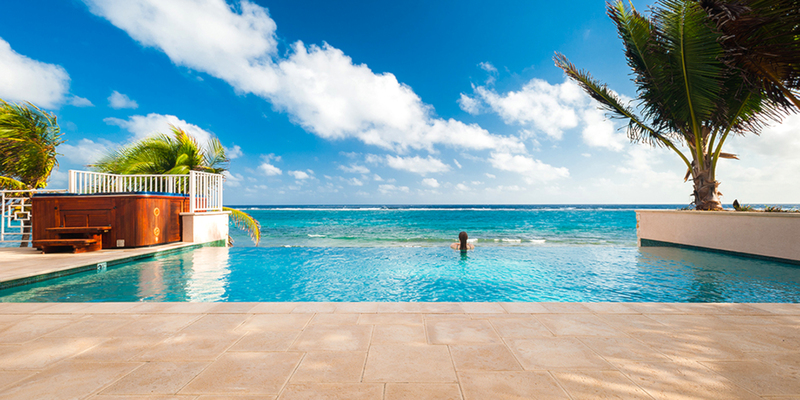 To the Cayman Villas staff and homeowner- Thank you all very much for what amounted to our best visit ever to Grand Cayman! We enjoyed Kai Vista very much, and plan to secure the home for our longer term visit again next fall. 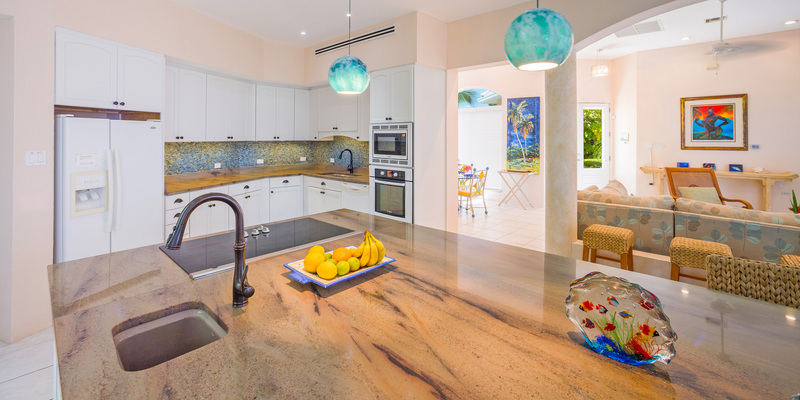 We very much appreciate the attentive nature of the local management as well as Cayman Villas, and loved the updates to Kai Vista! Thank you for investing in this beautiful place. We loved the new pool furniture, the master suite is beautiful, the kayaks were a blast, the bathroom improvements upstairs - lovely, and really we enjoyed every aspect of the home. The kitchen is well appointed, everything we needed was well at hand. It’s a short walk to Rum Point along the beach, the snorkeling right off the shore was spectacular. Parrotfish, stingrays, and pristine coral. Can\'t wait to come back! Thank you for your kind words! Please come back soon!!! What an incredible spot! The view is beyond stunning and the home is incredibly spacious. We went for a girls weekend and had an absolute blast -- we are already planning our next trip back! We did eat out at a bunch of restaurants. One of the best meals I ate was at Rum Point. We also ate lunch and dinner at Kaibo, Dinner at Tukka twice. The best brunch and most affordable meal of the week was on 7 mile Beach (Coconut Joe\'s) also we highly recommend dinner at Casanova (Italian). All in all it was a perfect vacation and I hope we will be back again soon! Book Kai Vista you will not be disappointed. This house exceeded our expectations! We wanted to stay in a less touristy area and Kai Vista was perfect. We rented a van that would accommodate both families from Murphy\'s car rental and stopped at one of the grocery stores and loaded up on breakfast and lunch stuff. Upon arrival at the house the kids were so excited as soon as they saw the infinity pool they had to put on their bathing suits and jump in. We were two families of 4 and had plenty of space in the house to never feel on top of each other. The master bedroom is downstairs which my sister and her husband stayed in. Their teenage son stayed in the other bedroom located next to the master downstairs. 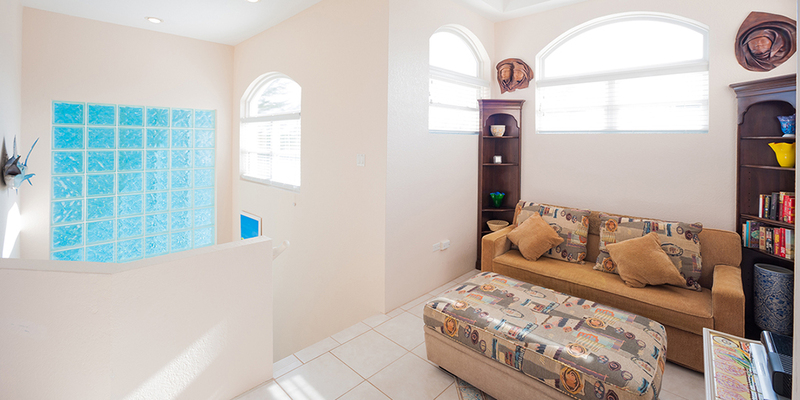 There are two bedrooms upstairs that each have a walkout balcony and their own bathrooms. My husband and I stayed in one of those rooms and my daughter and her cousin shared the other bedroom. My son was more than happy to sleep in the pullout couch in the upstairs hallway. I have to say the infinity pool was all our favorite thing about the house. There wasn\'t a day that we didn\'t hop in and cool off. We also took advantage of the hot tub. The kitchen had every gadget you could possibly need and they had plenty of spices left over from previous guests. Having access to the laundry room was such an added bonus. We were able to wash towels several times during our trip. We did charter a boat for the day from Silver Thatch and had George as our Captain he was great! We hit Sting Ray City, Starfish point, and went snorkeling... George found the perfect snorkeling site and it felt like we were swimming in a fish bowl. Incredible! We made a day trip to 7 Mile Beach and hung out at The Royal Palm. *Tip if you go there on a day there are no cruise ships you can use a cabana for free! Only downside is the pool is adult only, but it didn\'t effect our day because the water and beach on 7 Mile is incredible and you instantly want to go into the ocean. AMAZING HOME, LOCATION & AMENITIES! WHAT ARE YOU WAITING FOR??? We just returned home from an amazing vacation at Kai Vista! The property itself was top notch! As soon as you drive up the driveway and walk into the front entryway, you are greeted by a very spacious, clean and beautiful home. The property is a \'GREEN HOME\', which means it is run off of solar panels and is updated with an AC system that will turn off if a window or door is left open after 90 seconds!! We love to cook and boy did we ever! The kitchen is completely remodeled with a larger than life center island. We had 8 Adults stay at the property. There were exactly enough seats around the bar to eat breakfast and just hang out. We utilized the dining room for our dinners each night. There is an over abundance of silverware (this was NOT a problem, but awesome (since we had 8 people)! and we were very thankful for the thought put into all the utensils. Just about everything you would need was there and usually more than one of each! You will NOT need to pack a bottle or wine opener as there were many!! The Pool is amazing! I had packed several blow up rafts for lounging, but once we got there, we found enough floats already there and ready for use. I didn\'t need to even open the package. There are 2 adult bikes and 1 child bike in the garage. We did use the 2 adult bikes to ride into Rum Point for dinner one evening. The MASTER Suite is absolutely gorgeous! May I suggest to the property manager or owner to update the pictures for the Master and the Dining Rooms? They are now a white color and not the same as shown in the original pictures, which almost turned us off about renting the property (so glad we changed our minds). The Master was a burnt orange and it looked rather tight in the room, but it is a huge space. 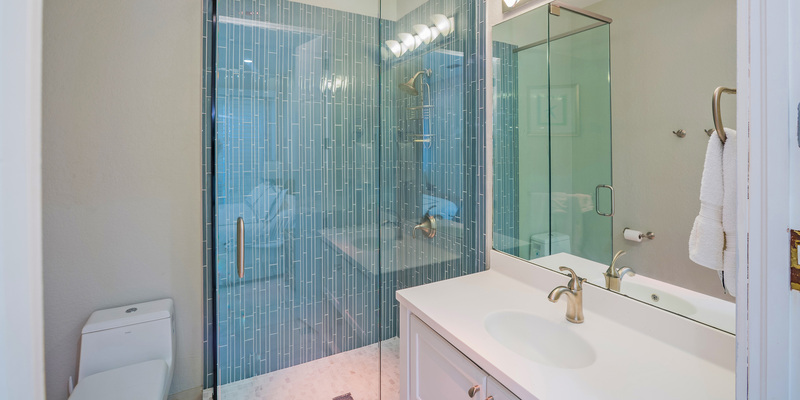 The Master Bath is also huge! We loved the sinks and walk in closet! Roy (J&J Enterprises) is an awesome person and replied to me rather quickly on all my questions /requests. There was even a marriage proposal!! Paradise, luxury, peaceful and gorgeous views are just a few of the adjectives to describe Kai Vista! 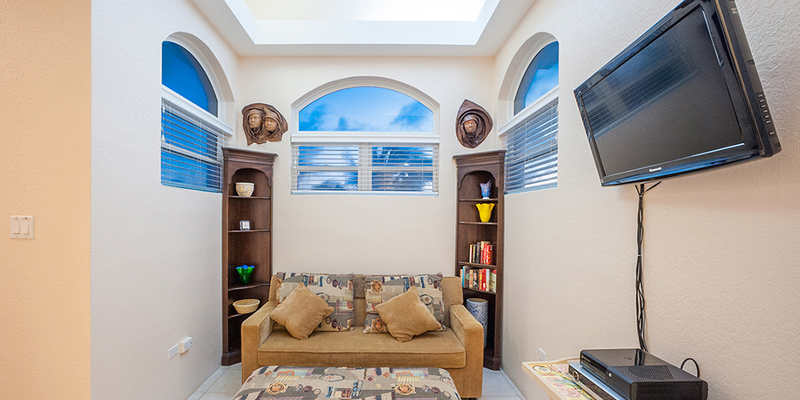 The villa has absolutely everything you could want or need in a vacation home! I have to say that the beds are very comfy and sheets and bedding are luxurious! The home has all the electronics you need and more! We were concerned about the availability of watching the Patriots game but NO worries!!! Not only did we get to watch it but it was on one of the three large screen TV\'s that was in the house! The kitchen is equipped with any and all appliances that you need. There are multiple dining areas, 3 of the 4 bedrooms have their own bathroom, with the 4th being right outside the bedroom. The infinity pool and hot tub were a must have and they did not disappoint. Going from snorkeling in front of the house to the pool and the hot tub was absolutely enjoyable and relaxing! The location is great! Rum Point has 2 restaurants and Red Sail sports on the premises to offer you catamaran sails to Stingray city and snorkeling and much more! Starfish beach is a 5 minute ride from the villa. Kaibo restaurant is open for lunch and Kaibo Upstairs is a 5 star restaurant that you should definitely try!! If you like Rum, they have some very exotic types to try! Also try Tukka, about a 15 minute ride to the East End. We ate on the beach and the food is excellent! If you ever have trouble (which we didn\'t) the management company is on call and readily available. Make sure to read the lists and advice they have on their app! It is great advice!! We plan on renting for 2 weeks next year! We stayed for a week in December to escape the cold at home and had a fantastic time. 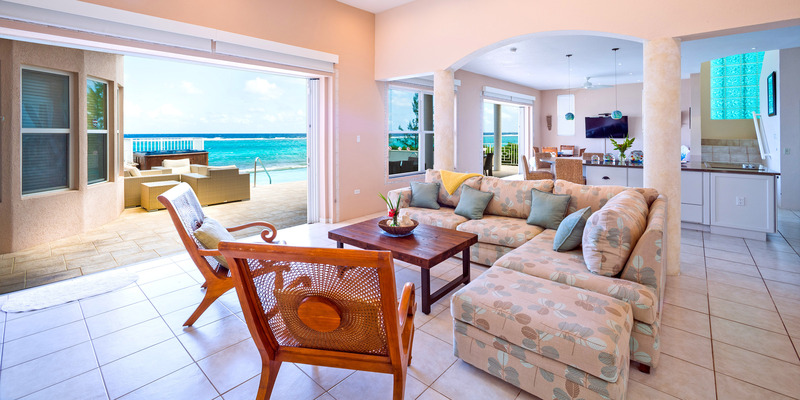 The house exceeded expectations from the pictures (even though the pictures looked amazing) and everyone at Grand Cayman Villas was very helpful and prompt in responding to any questions we had prior to our trip. Check-in and out was simple and easy...and all the recommendations and checklists provided ahead of time really helped with planning some of our activities during the week. Highly recommend paying the extra fee for the pool heating, as it really made a difference (especially in the evenings). Rum point was just a short walk away and everything else we had wanted to do was a short drive (having a rental car certainly is needed on this side of the island). The upgrades to the kitchen really made it nice when we spent a night cooking at the house rather than going out. Despite being next to the public beach, it was very quiet and secluded all week...only a few snorkelers here and there heading out from the beach. Would love to come back again. 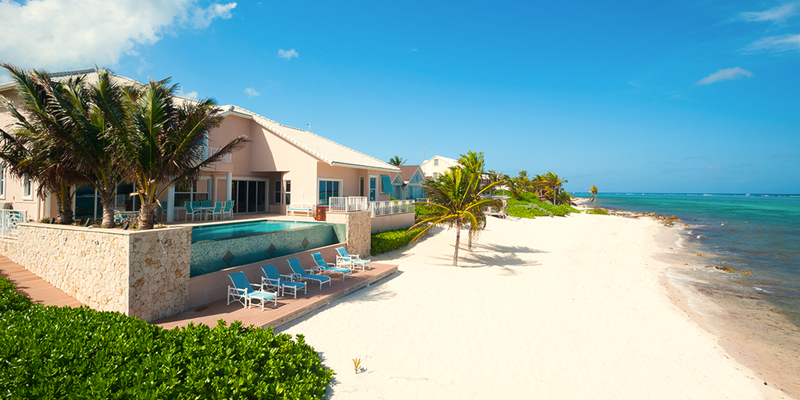 Highly recommend this house for your stay on Grand Cayman. We are an extended family of 9, 2 grandparents, 4 parents, 3 grandchildren ages 12, 10, and 5. 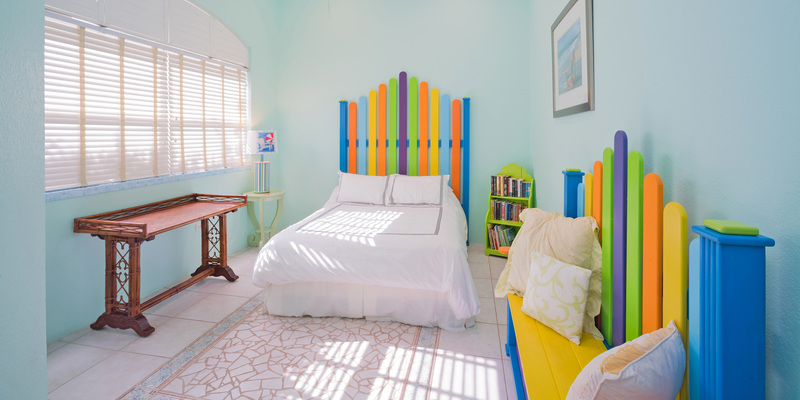 We were thrilled with the bedroom setup which allowed the older child and grandparents to stay downstairs and each set of parents got a private room with the two younger girls on the sofa bed upstairs. Having 4 bathrooms is especially nice when you are constantly in and out of the water. The roomy downstairs allowed us to have several playing games and using laptops in the dining room, some reading on one of the sofas and others making puzzles and watching TV in the second living area. There were more balconies and outdoor lounging areas than we could even make use of. The kitchen is roomy and well equipped and having 8 bar stools instead of the usual 3 or 4 was also a real plus for breakfast and lunch. Since we only had one car, it was nice to be able to walk back and forth between the house and Cayman Kai. We also appreciated not having to bring beach towels, beach and pool toys, everything was provided. The kids loved the pool and spent hours in it. We snorkeled and some even tried the kayaks. The beach, the hammock, the location, and especially the view-everything was perfect. Any small problems were immediately addressed by local management company. Great service. Sometimes vacation property owners use the word luxury and then you find out they exaggerated. Not this time. Everyone in our family (2 grandparents, 4 parents, 3 kids ages 12, 10 and 5) had a wonderful time in this large impressive home. There were plenty of sleeping areas, plenty of bathrooms, lots of room to spread out during the day and an unbelievable amount of outdoor activity space and furnishings. The dining table was easily big enough for 9. We also enjoyed casual eating around the gigantic kitchen island with 8! bar stools. We used the gorgeous infinity pool several times every day, and also the hot tub. Loved the lounge chairs and hammock. Almost everyone tried out the kayaks, snorkeled out front, walked the beach and dug in the sand. There were beach and pool toys available and even a few puzzles and games for nighttime or during rain showers. Electronics were everywhere and a great wi-fi connection kept everyone happy with their personal devices. Being close enough to walk to Rum Point was a bonus as well. The convenience of food and drinks at Rum Point can\'t be beat. We loved Red Sail sports and rented snorkels, jet skis and the water trike and bought a Stingray City cruise from the very friendly folks there. 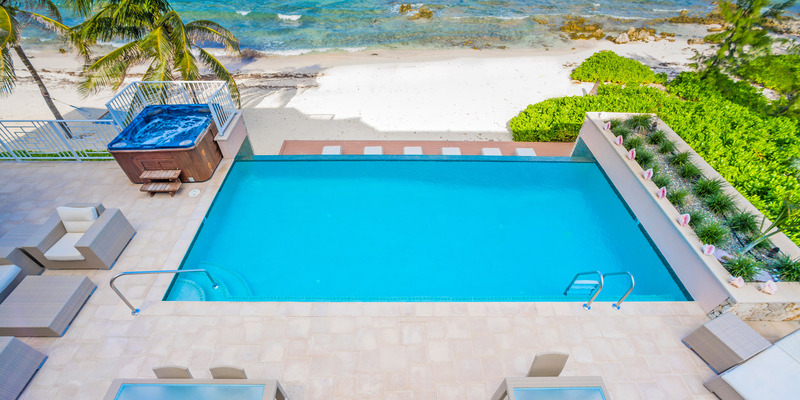 The only minor drawback to the house location is being a little far away from the airport, Georgetown and other Cayman attractions, but the privacy and lack of crowds more than compensate. Kudos also to the management company who responded very quickly to resolve a/c and minor maintenance issues. The beach is rocky and entry into the water requires care, but the view anytime of the day or night was just amazing. Great food at Over the Edge. Suggest you buy groceries at one of the larger markets in or near Georgetown on your way from the airport or you will pay premium prices for very small selection. We had the pleasure of staying at Kai Vista in early February 2016. We had a group of 7 people and the house and the setting was more than accommodating. The rooms are very spacious and the open floor plan on the main floor served as the best way to enjoy meals together and cook. We utilized the hot tub and pool every day, and would recommend paying extra to heat the pool for evenings. This was an amazing rental home and we commend the house staff for their welcoming and clean environment. We had a fabulous stay at Kai Vista! We had the best snorkeling experience directly in front of the house and even saw a sea turtle! Everything was amazing; Sting Ray City, Rum point, snorkeling over the wall. We loved tasting the local food both during home cooked meals a nd restaurants like Vivianes Kitchen and Kaibo. The house, pool, beach, hottub and sea were amazing. We had an amazing time at this gorgeous house. The location is unreal! Our kids were in heaven- the kayaks were a huge hit. The snorkel reef in the front yard provided hours of fun. I would highly suggest for a extended family getaway! The kitchen needs some updating but we understand that is coming soon. The location could not be beat! The house was fully stocked with anything you could want. Kai vista was spacious with plenty of room for all. As expected the house had multiple minor issues that did not detract from the overall experience. The infinti pool was hardly at Infiniti level and a cleaner should have been run daily. Pool was dirty by end of week. Rosie came and cooked for us twice. Highly recommend her. Awesome food and a nice lady. We truly enjoyed our stay and will recommend kai vista for people who want to truly relax. We spent 13 days enjoying the fantastic view from this home. We lived outdoors. The patio furniture is very comfortable, the pool is lovely, and the hot tub was great for those cool, windy days and evenings. The sound of the waves crashing over the reef is wonderful and the turqoise waters beautiful. We had some issues with the pool shutting off and the hot tub needing fresh water, but once we called it was attended to immediately. We experienced the pool with the waterfall off at first and we were disappointed, but then once it got turned on, the wind blew the water back and you had to move your chairs around to avoid getting wet. On a really hot day, that spray would have felt great, but some of our time there was cooler. The kitchen is well equipped and the dining room comfortable for our party of 8 (including the infant high chair). The home is spacious. The home has plenty of seating, but the couches were not to our personal preference as they are a bit low to the ground. They are far better than the wicker you find in villas so often. The younger set lounged away and didn't seem to mind. There is one footstool which is something I look for in a rental. The TV is a flat screen, but on the small side; but we didn't use it but one time anyway, so this is not a high priority item for our family. The beds are more comfortable than most. They all make a noise when you first get in, but there were no morning backaches from the older crowd. All were pleased. We have rented villas for the past 15 years and our family has gotten to be pretty critical. 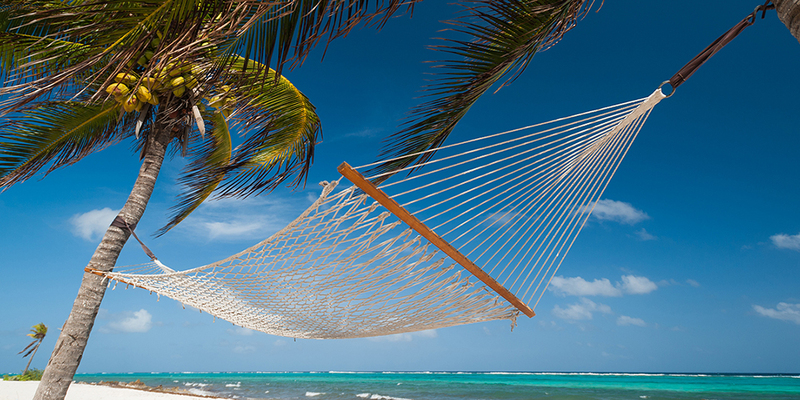 The beach is well maintained; the hammock was enjoyed, especially by the young couples. We appreciated the snorkel gear and pool toys, but were disappointed one of the kyaks was out of comission. We did walk easily to Rum Point and enjoyed strolls on the beach. This home was cleaner than most. Over all this is one of the nicer rentals and our family voted it to have the best view possible. We have been to Grand Cayman many times and always stayed on Seven Mile Beach, but never again! Now in addition to our children we have grandchildren and a villa is definitely the only way to go. This house exceeded our expectations. The pool was gorgeous--ask for the heater! and the snorkeling right outside was, as everyone else has stated, the best on the island. The power went out one late afternoon and the property manager was there within a half hour with candles, which we ended up not needing as the power was back on in an hour. We walked to Rum Point many times and only went into town twice as there was no need! We will definitely rent this house next time we come.